A spacious bell tent with simple furnishings and vintage styling on a camping and glamping site in the Norfolk Broads National Park. Our beautifully furnished bell tents are perfect for a family getaway with out the hassle of pitching! Complete with a picnic bench, charcoal BBQ, fairy lights and futons beds. 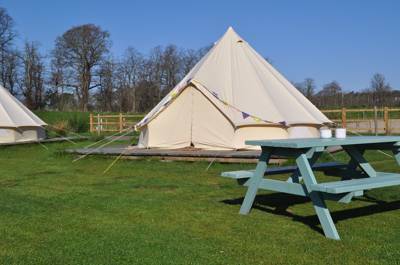 Each bell tents sleeps up to a family of six or a maximum of four adults. Perfect for families, each tent has two double futons and two fab fold-out mattress beds. Or, for those looking for a little bit of peace and quiet, why not come and stay for a nice chilled out weekend with your partner and enjoy a few nights under canvas? The tents are fully carpeted with coir matting and have zipped windows at the base for peeking out at the views. Check in is normally from 2-7.30pm, check out by 11am - please check booking info for full details.